Talking about today's post, I share all the outfits you saw in May, any favorites? Click on the image to see the whole post in case you missed it. Bella sempre, ma in rosso e maxi dress sei il top!!!! Beautiful, you had stylish month of May. Love all the looks. Very nice looks for May; if I had to pick, I'd say that 3 and 4 are my favourites. Already looking forward to your June outfits! Have a nice evening. Io scelgo il 4.. è cosi romantico quel maxi dress stampa floreale Lilly..
All this look was my favorites in May, Happy start of month Lilli! Sei sempre meravigliosa Lilli! Un bacio. 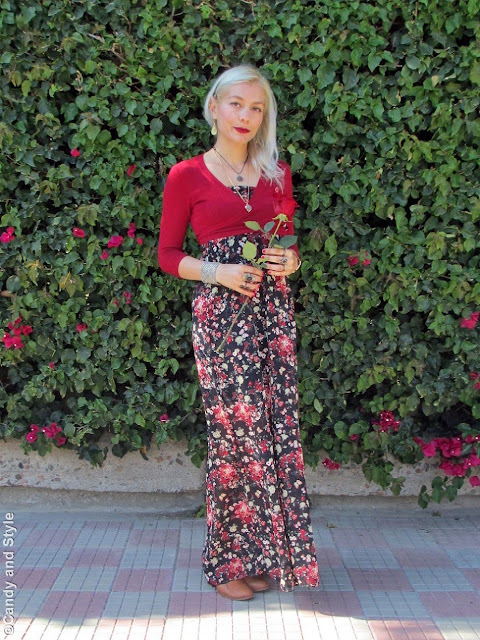 I remember all the outfits and this is another great monthly roundup, Lilli! Lilli, you beauty! That picture of you with the rose is just stunning! My favorite was that dark floral dress with shrug sweater. Gorgeous on you. Oh my, it's June already. Your Spring outfits are so pretty and feminine. Have a wonderful week. L'outfit con vestito rosso a fiori è bellissimo e romantico, mi piace molto anche quello in stile boho con gilet a frange!! new post" mini is back"